the third typs is the combination of both types previously mentioned. Folded bellow is stitched at edges along with pvc stiffeners inside each fold. suitable for dry as well wet uses. 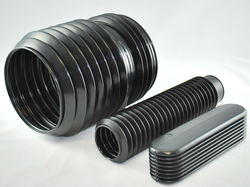 These bellows are excellent for high speed conditions and are aesthetically best looking. Sewn bellows are used when strong movement is required. And where a compact closed pack is required. It is a excellent protection for shafts, worm screws, ball recirculation screws, made of rings of various materials and thicknesses for all applications. 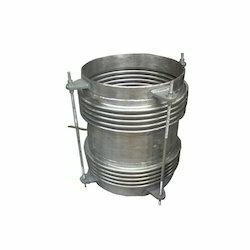 We are offering Plant Bellows. Material: EPDM, NBR, Nr, Cr etc. We are engaged in offering a wide range of Metallic Bellows which is extensively to stop dust particles, metallic chips and foreign particles from entering in the important parts of the machine. This helps in minimizing abrasion and provides longer life to the machine parts.